Really Superb Victorian Pine Bank of Fifteen Drawers scraped back to its Original Finish. Wonderful labels visible still on the drawers. All the original iron knobs. 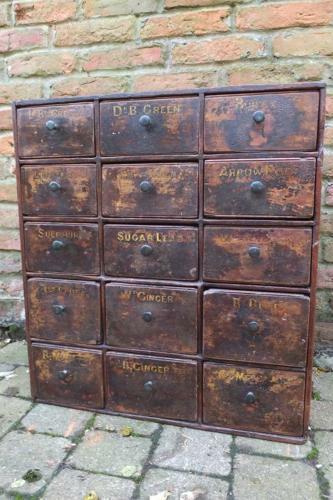 Would have been an Artist`s Bank of Drawers Originally as the labels are all Paint Colours. Would freestand anywhere but there are hooks on the top if you wanted to wall hang. Would have to be collected or sent by courier. Any questions please contact me. Thank you.